Can you believe that Spring is right around the corner? I know that we are all getting excited for the weather to start warming up! But we don't want to forget the month we're in. 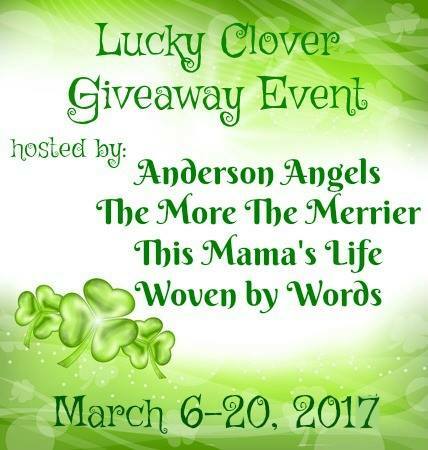 Anderson's Angels, This Mamas Life, The More The Merrier and Woven by Words, are very excited to bring you the Lucky Clover Giveaway Event! We've teamed up with over 20 other wonderful bloggers, to bring you another great giveaway event! Each blog has gathered a prize package worth $25 or more so be sure to visit each blog and enter! Hosts & participating hop bloggers of the Lucky Clover Event are not responsible for sponsors or self-sponsoring bloggers that do not fulfill prize obligations. I really need a potting bench and would love to have the cedar one from Eartheasy. I would also like to have the Versa Rocket Stove by EcoZoom. I already have an emergency kit for my big pup, so I like the Small Dog Emergency Evacuation Kit. I would like the rolling patio planter!! I've been a fan of this company for a year now. One favorite that is practical for us in hurricane county is their outdoor cook stove..need it! Unfortunately! I would LOVE the ten stage countertop filtration system!! I'd like the Jorka JK270 Composter as well. I would like the Kids Experimental Greenhouse Kit. My grandson would love it. I would love to get the Fagor Splendid Pressure Cooker/Canner - 4, 6, or 10 Quarts. I like the Durarocket stove. I would like the Natural Cedar Pagoda Bird Feeder. I would love a Great American Rain Barrel. I've always thought this would be the coolest way to water my garden! I'd love either the garden trolley or the rain barrel! I like their rolling patio planter! I'd really love a LifeStraw water bottle! We've got a campsite on a lake with no utilities, and hauling carboys of drinking water is kind of a pain. Having a safe way to drink lake water in an emergency would rock. I am loving the LifeStraw Family 1.0, I love what it is doing and what it can do for others. I like the onsight duffle bag. I'd also love the Fagor Stainless Steel 3-in-1 Electric Multi-Cooker - 6 Quart. I've heard such great things about pressure cookers lately! I'd like to have the Noodlehead Lawn and Garden Sprinkler. Thanks. Wow, the worm factory is perfect for me. Thank you so much!! I would like the LuminAID PackLite 12 Solar Lantern. I like the biodegradable bamboo plates. I like the Farmstead Raised Garden Bed. It would make containing our spring garden easier! 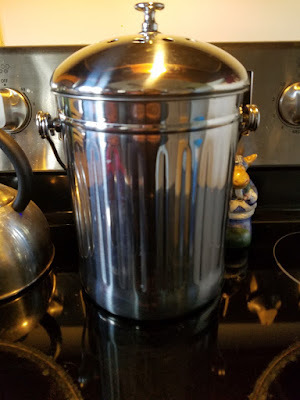 Oh man, I'm loving the Worm Factory 360 Composter! So many great products, but I'd love some of their raised garden beds. I would love to have the Little Sun Solar Lamp. I would love to try the Honey Bee Bar- Honey Oatmeal Soap. I'm always looking for good all natural soap. I would like the Natural Cedar Raised Garden Bed. The Set of 5 Reusable Produce Bags is something I know I would get a lot of use from. I'd love to avoid using those plastic bags at the store, and these reusable bags would be the perfect solution. I'd like their rain barrel. I would like to get the 6 quart Fagor Stainless Steel 3-in-1 Electric Multi-Cooker. I love the Fagor Duo Combi 5 Piece Pressure Cooker Set. That is a nice looking set. The Bambu cutting boards would be useful in the kitchen. I like the composite raised garden bed. I really like the natural cedar raised garden beds. These are pretty and just the right size. I would like the EZ-fit Chicken Coops. I'd like a raised garden planter. I like the Natural Cedar Raised Garden Bed. I would like to have Cedar Complete Raised Garden Bed Kit - 8' x 8' x 20"
I would like the Breezecatcher Clothes Dryer - Rotary Clothesline. I would love to try the Life Straw. I love the Little Sun Solar Lamp. I would love an All American Sun Oven. I would love to have the Rock-solid Cedar Planter with Bottom Shelf. I would love to have the "Riverstone Monticello Quick Assembly Greenhouse". I would love the Natural Cedar Pagoda Bird Feeder. I'd like to have the LifeStraw water bottle. Deer Proof Cedar Complete Raised Garden Bed Kit - 8' x 12' x 20"
I like the CobraHead Precision Weeder and Cultivator because it is a hard job and makes it look so easy.